Enjoy display what’s on your Apple iPhone X on a bigger screen, such as a TV or projector with these steps. The Lightning to HDMI adapter allows your iPhone 7 to work with almost any HDMI device. 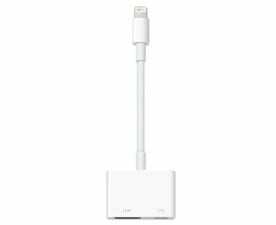 You can attach your iPhone 7 to a TV using the Lightning Digital AV Adapter. Connect the adapter to your iPhone 7, then connect an HDMI cable between the TV and adapter. Once connected, video will be mirrored on the screen. Audio is also routed to your TV. Most apps work with this setup including Hulu and Netflix. Some apps like HBO Go and NFL Mobile do not allow mirroring via a cable connection. Connect an Apple TV to your television. Swipe up from the bottom of the screen to reveal the Control Center. Select the “Apple TV” device from the list. You should be able to select this as long as both devices are on the same wireless network. That’s it! You are ready to enjoy streaming content from your iPhone X to your TV. How to get this cable via online. Can you please forward the details.